Sandwiches are my favorite food. There is nothing a sandwich can’t cure. I have loved sandwiches every since I can remember. In elementary school, I would always trade away all the components of my lunch with my friend Amy whose mom made a killer tuna fish sandwich with chopped hard boiled eggs mixed in. A masterpiece I made on my own was toasted bread for the traditional peanut butter and jelly. That toasting took the sandwich to an entirely new level. Crunchifying my sandwiches with a layer of chips has been a lifelong habit. I even wrote about my love of scrambled egg sandwiches and what they meant to my childhood. As I got older, I discovered the joys of really complex sandwiches. When I travel, I seek out eateries that specialize in big, unusual sandwiches. I once ate at the legendary Zingerman’s Deli in Ann Arbor, Michigan where they have such crazy cool names for their sandwiches like Abra’s Nutty Yard Bird or the one I had, the TNT Cowboy Reuben. I collect cookbooks, and found some entirely devoted to sandwiches like Tom Colicchio’s ‘Wichcraft. Other cookbooks with truly good sandwich recipes include Joanne Chang’s Flour, Too, and Thomas Keller’s Ad Hoc at Home. All this sandwiching has showed me the possibilities are endless. However, sandwiches right now are under fire. Too many carbs, not Keto enough. The sandwich is being deconstructed into stuff that doesn’t make sense. Instead of bread sandwiches are being sandwiched with everything from big pickle slices to lettuce to stuff that masquerades as “bread.” Now I can totally get down with a lettuce wrap of protein and veggies, but let’s not pretend it can replace a sandwich. We live in a time where trends determine much of what we eat and what we don’t eat. Whole food groups are banished for periods of time under the guise of healthy lifestyles. With the exception of diagnosed food allergies, we should embrace all foods in moderation. 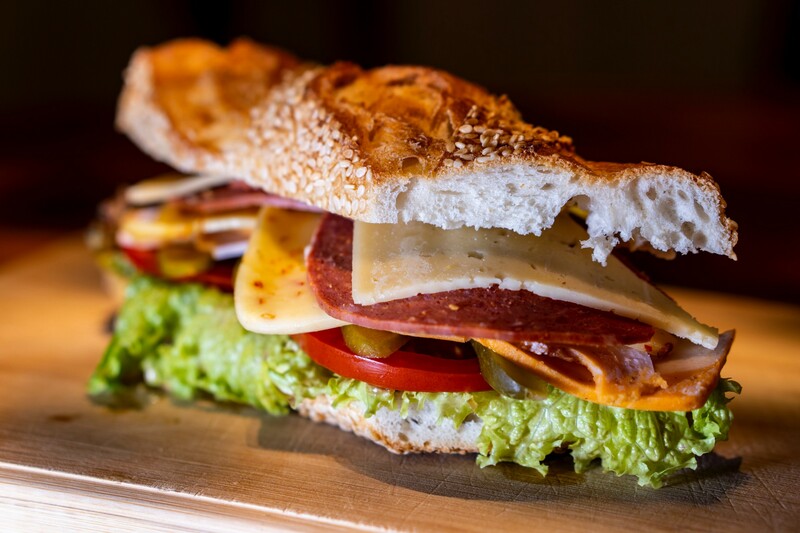 Sandwiches made with good ingredients, locally-sourced if possible, and homemade are to be valued, not vilified for their carb/gluten/sugar content. I will defend the sandwich until the end. Not just for taste, but because it has become my metaphor for life. I never thought of my love of sandwiches as other than just a food craving. Then I learned it could actually be a philosophy for living when I saw Warren Zevon’s last appearance on The Late Show with David Letterman. I’ve been a fan of Zevon’s ever since I saw him fill in for Paul Shaffer on Letterman’s show when I visited NYC in the 1990s. He was funny, and his songs were so interesting. Zevon’s songwriting is real poetry. In 2003, Zevon was diagnosed with a rare form of terminal cancer. In the few months he had left to live, he shared his talent one more time with the world through the creation of his final work The Wind. He also made one last visit to his old friend Letterman. At the end of the interview, Letterman asks Zevon what we should know about life. Zevon’s response is beautiful in its simplicity. Warren Zevon during his last appearance on the Late Show with David Letterman. The beautiful moments are often the quiet ones, where we stop and really pay attention to our experience. A sandwich prepared just right. A song that moves us. When someone says something really funny and we have a good laugh. Looking up to watch the clouds slowly move and morph. That’s why Zevon’s advice to enjoy every sandwich resonates so deeply with me. It’s a reminder to be mindful, and to savor every moment. As we run through this life, stressed and angry we miss out on the things we need the most. In our rush to do it all, we miss it all. So stop. Take a break. Eat the sandwich. Live your life on your terms. Have no regrets.